You gotta give it to the Chinese, calling the start of spring in such unspringy conditions. 1. I’ve never seen a Chinese lion in unmatched tops and bottoms. E.g. Red lion with green legs. 2. Even better, red lion with black The North Face track pants. 3. Lion dance backup music without drums (no-bass amateur mix, I think that’s what they would call it). 4. And finally, a truly cosmopolitan troupe, with a Hispanic as 大头娃娃 (scary bald man with oversized head of plastic fanning himself incessantly even in the freaking cold New England winter) and with 鬼佬 on drums. To their credit, they both performed quite well. 鬼佬 probably a drummer in a college band on minimum wage or something. And yes happy Chinese New Year (aka Spring Festival to some wacky Chinese). It’s good to be back. 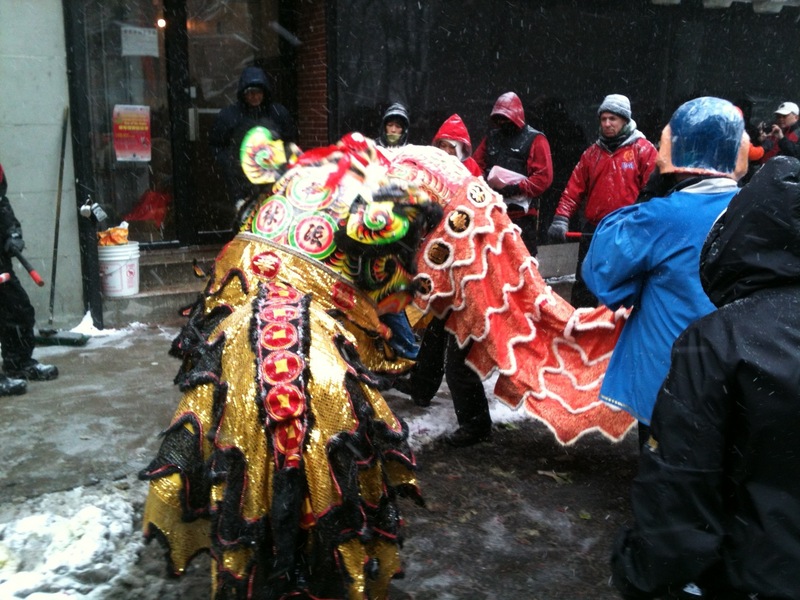 This entry was posted in Society and tagged Boston, Chinatown, Chinese, Chinese New Year.